Too many chocolates? Too many tantrums? This Easter, keep everyone happier and healthier by bringing them to London Aquatics Centre. With so many different activities to choose from, we’ve got plenty to entertain the whole family. Enjoy a day at the pool, we have Ultimate Aqua Splash sessions, short swim courses and diving lessons. There is also the kids holiday activity camp Fit For Sport at Copper Box Arena. The UK’s largest aquatic inflatable indoor obstacle course, Ultimate Aqua Splash returns this Easter holiday for all the family. Sessions are available on weekdays from Monday 15th – Friday 20th April. London Aquatics Centre will be running weekly short courses, with a variety of different dates to choose from which suits you best. The courses are aimed at all ages and levels, with one 30 minute lesson daily for five consecutive days. Depending on your level, lessons aim to promote water confidence for beginner swimmers or improve essential swimming skills for more advanced swimmers in a fun and enjoyable environment. Learn to dive this Easter with our Tom Daley Diving Academy Holiday Short Courses. Our Learn to Dive programme, is in partnership with Olympic Medallist Diver Tom Daley. The programme is designed for all ages and abilities wanting to take up this exciting sport. So whether you have aspirations to follow in Tom’s footsteps, want to learn something new, or just want a new way to keep fit, there has never been a better time to start learning to dive. Diving Short Courses will be running between Monday 8th – Friday 19th April. 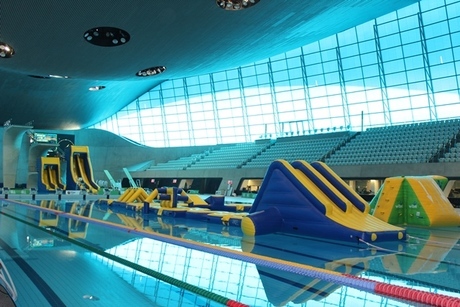 Fit For Sport run will be running their Activity Camps based at the Copper Box Arena with swim lessons at the London Aquatic Centre. The multi activity camps are run for children aged 4-12, by one of the UK’s leading provider of fun-filled Activity Camps.